Bake an 8 inch two layer round cake. Also bake five block cakes in a block pan. If you do not have a block pan, bake a half sheet cake and cut it into 4 inch squares layering them to get your 4 inch square blocks. Be sure to ice between the layers. Place 5 blocks in a circle with the back corners of the blocks touching each other to form a smaller circle. Refer to the picture above. Ice the blocks in yellow, pink, blue, green and purple icing. With white icing and shell tip size #16, make the shell border on all edges of the blocks. Using the same star tip, make the letters on the sides of the blocks spelling out baby. Repeat B-A-B-Y all the way around. Place a cup or small box to fit in the center of the circle the height of your blocks. This is most important because this will help support your 8 inch round layer and keep it from crushing your blocks. Place the 8 inch 2 layer cake on an 8 inch cardboard circle. Ice in white icing. Place it on top of the blocks making sure it is centered on the blocks. With white icing and star tip size #16, make a shell border around the top and bottom of the sides of the cake. With pink and blue icing, write Baby on the front side of the cake using the same size star tip #16. The pink and blue blocks are the center of the front of the cake. Refer again to the picture. Make a pink and blue bootie on the center top of the cake. To make the bootie use pink and blue icing and star tip size #16. Make a small foot shape and fill it in. Make a second layer on top of the first. At the heel end of the foot, make a small circle to represent the ankle cuff. With white icing and round tip size #5, make a bow on each bootie at the front of the ankle cuff. Pink and blue dots may be added to both sides of the shell border with star tip size #16. 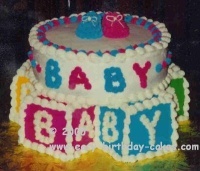 This cake makes a great first birthday cake or baby shower cake.